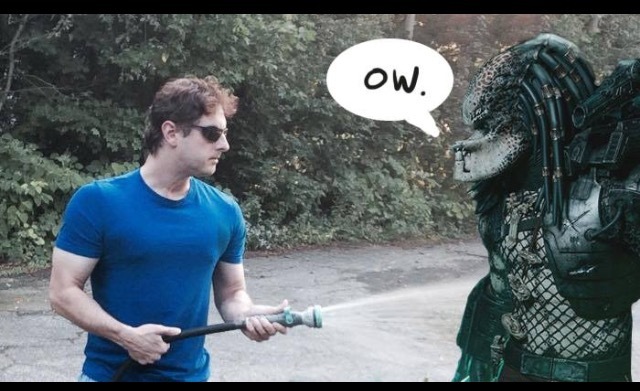 In case of the former, garden hose beats Predator. Photoshop courtesy of Andrea Stewart. That quote is typically used as an ominous prelude to stories about alien invaders; it even opens the game XCOM. But what about the other scenario listed there? For the record, I find it highly probable that simple life may prove to be extremely common (where conditions are favorable.) I have a dinner bet with writer friend Andrea Stewart that life will be discovered in our own solar system, likely on a Jovian or Saturnian moon. However, when it comes to intelligent, advanced, civilization-building life, I’m of the opinion that it is EXTREMELY rare: the Great Silence owing to a series of Great Filters. Using the data-point of Earth, life was around for a half billion years before (to our knowledge) it achieved civilization. Our species was fortunate to have thus far survived the gauntlet of extinctions and supervolcanoes and pandemics… and now we face technological hurdles like surviving nuclear war, to be followed by whatever we may yet develop (antimatter mass production, black hole manufacture, rogue AI, lab-developed bioweapons.) We’re clearly not through the proverbial filter yet, and we aren’t dispersed enough to handily survive any ghastly Big Mistakes (i.e. Dan Simmons’ Hyperion Cantos). My suspicion is that civilizations are truly rare (far rarer than Drake Equation estimates.) Few actually make it past these hurdles, and those that do make it are too far away in space or time period for first contact to ever occur. Back to life on this particular world, I made two sales this month. The first was to Third Flatiron’s STRANGE BEASTIES anthology; my story “Project Sargasso Findings on Global Nightmare Epidemic” will be published there very soon. The story was written as a challenge to self: I wanted to try writing a story that was 100% dialogue, with no description or anything beyond the vocalizations of two people having a conversation. The second sale is of my novelette “Crash-Site” to Fantasy & Science Fiction. This is a major story of mine, a kind of nexus in my “War Hero” universe as it brings together characters and events from several of my other published works. Should appear in the first half of 2018. I received my complimentary copies of another anthology today: ALL HAIL OUR ROBOT CONQUERORS from Zombies Need Brains Press. My contribution is “Director X and the Thrilling Wonders of Outer Space”, a love letter to the sci-fi genre, and classic sci-fi films. There’s innocence and optimism and a lot of fun in this tale. 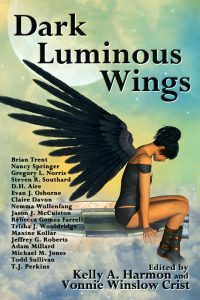 And speaking of anthologies, my story “Enchantment Lost” is the opening act in Pole to Pole Publishing’s DARK LUMINOUS WINGS, coming out in October. Fellow TOC mate and prolific author Steven R. Southard of Poseidon’s Scribe has posted an interview with me on the story. 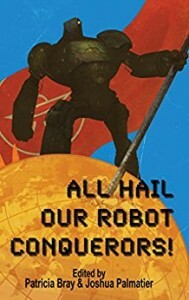 This entry was posted in Blog and tagged all hail our robot conquerors, Dark Luminous Wings, director x, enchantment lost, great silence, pole to pole publishing, poseidon's scribe, steven r. southard, third flatiron, zombies need brains. Bookmark the permalink.